Welcome to our Croatia Travel Guide where we try to answer the most common questions regarding your travel to Croatia. Croatia is emerging tourist destination. When I think of Croatia, I associate it with: small, safe, sublime, pebbles, islands, sea, countryside. The country has over thousand islands, 8 national parks, 11 nature parks, over 6.000 km of coastline and ten World Heritage sites. From Paklenica climbing sites, beautiful beaches of central Dalmatia, great food of Istria, Croatia’s fabulous wines, partying on the islands, sailing the Adriatic, Croatia has a lot to offer to its visitors. We’ve dedicated this entire website to this wonderful country. Vera is born and raised in Croatia, and I moved here 14 years ago. We’ve been traveling around Croatia extensively. And here at our blog we share the best of Croatia just as we discover it. Visitors to Croatia can find useful travel tips, in-depth destination guides, things to do, places to stay, and lots of information on Croatian food and restaurants. I also sometimes share my musings on expat life in Croatia. 1 Do you need a visa? Majority of foreign visitors don't need visa to enter Croatia, including, but not limited to, EU countries, UK, USA, Australia, Canada, and New Zealand. Foreign citizens of those countries can enter Croatia, and stay here for 90 days within 180 days period. Citizens of EU countries can enter Croatia using only their ID card, all others need to travel with a valid passport in order to enter Croatia. If you require a visa to enter Croatia, but hold a valid Schengen visa, as well as visas for Cyprus, Romania and Bulgaria, you don't need a separate visa for Croatia. You are free to travel to Croatia under the condition of your current visa from the above mentioned countries. If you require a visa for Croatia, you can print and fill the application forms here, and submit it along with requested documents to Croatian Embassy, Consulate, or an accredited tourist agency. In order to apply for a Croatian visa, you'll need a valid passport issued less than 10 years ago, and with an expire date at least three months after the intended departure date from Croatia. All questions regarding visa you can send via vize@mvep.hr. Croatia has three distinct climates: continental climate in its interior, the Mediterranean climate along the coast, and the mountain climate above 1200 m.
Along the coast you can expect dry, hot, and sunny summers, and mild, although sometimes wet, winters. Weather along the south Adriatic region of Dalmatia is generally drier and sunnier than in the northern Adriatic region of Istria. Daily temperatures can differ up to 5°C. Average summer temperatures are around 22°C, but this also means that in July and August you can expect over 40 days with daily temperatures of over 30°C. Average winter temperatures are around 10°C, with January being the coldest month with daily average temperatures of less than 10°C. The average sea temperature varies from 12°C in winter to 25°C in summer. Croatia's interior has a moderate continental climate. This means that winters are cold and wet, with lots of fog, while summers get hot, and dry. Average winter temperatures are around 4°C, while the average summer temperature are around 22°C. While Croatia is a part of European Union, the country still doesn't use Euro as a common currency. Croatian currency is Kuna (short: kn), and the exchange rate is at about 7,5 kn per 1€, 6,5 kn per 1$, and 8,4 kn per 1£. You can also pay many things with Euro, like accommodation, meals in restaurants, pay-tolls on Croatian roads, and gasoline. However you'll usually get your change in Kuna, and the exchange rate can be less favourable than at the exchange offices. When withdrawing money from the ATM, try to use official banks' ATM machines (they should have a sign of one of Croatian banks like Zagrebacka, Privredna OTP, Erste, or Adikko bank. These ATM machines are usually near a bank's branch offices. In resorts and hotels you'll more often find Euronet ATM machines (blue and yellow). While they are often located at more prominent spots in towns, hotels and resorts, and thus more convenient to use, they are also more expensive to use. However, if convenience is more important than few euros here and there, go ahead and use these machines as well. Another thing regarding the money that you need to be aware of is so called dynamic currency conversion. This basically means that the amount of your credit card transaction is converted to your home currency at the point of sale (rather than by card issuer). In hotels or restaurants, or just about anywhere where you intend to pay by credit card, the staff might ask you if you prefer the charge in local currency (Kuna), or in your own currency. While theoretically you might profit sometimes from being charged in your own currency by merchant on the spot, it rarely happens in reality. You will just end up paying more than you otherwise would. So always choose to pay in local currency. Or ask for the exchange rate and compare it with one you find that day on internet. Majority of tourists head to Croatia in July and August. However, busiest time is not always the best time to visit. The best time to visit Croatia is in June and September. There are far less people around (definitely no queues, traffic jams, nor crowded beaches), the weather is still warm and sunny, prices are more affordable, and the sea is warm enough to swim in. Another tip: Sea is usually warmer in September than in June. Also, keep in mind that Croatia is extremely popular among Germans, and Austrians, especially the northern Adriatic regions of Istria, and Kvarner. So crowds (and accommodation prices) tend to increase around German school holidays (like Corpus Christi – it's either in mid May to early June, or late May to mid June; it changes from year to year). Ha, but this also means that in the year when German school holidays are in May, hotels often offer special discounts for June. And vice versa. We all have our own rules an tricks when it comes to packing. However, we’ll give you few ideas on what to bring to, and what to wear in Croatia. Croatia has four seasons, and three distinctive climates: Mediterranean climate along the coast, mountain climate on its rugged mountains and a continental climate inland. This means that if you are visiting Croatia during the summer majority of your clothes should be light. Nevertheless, a windbreaker jacket, and a pair of long pants, and leggings always come handy. For the rest, take a couple of shorts and tops that you can mix and match, or few casual summer dresses. Don't forget your beachwear including swimsuits and cover ups, water shoes, sun glasses, and microfiber towel. A pair of sandals, and a pair of walking shoes is also a must. As for the rest, don't forget your photo equipment (with plenty of extra batteries); waterproof phone bag; adapters and converters (Croatia uses 220V, 50 Hz frequency, and type C & F plugs. Both are similar plugs with two round prongs with 19 mm between the two); and other small things you will find indispensable in Croatia. Here is our full post on what to bring to, and what to wear in Croatia. Travelling to Croatia from anywhere in Europe is quite easy. From April through September many airlines have direct flights from all over Europe to all major Croatian towns. Besides, Split and Zagreb are connected by plane with the rest of Europe throughout the year. For the detailed information on flights schedule to Croatia consult Skyscanner website. We've also recently found out about Scottt's cheap flights program. They basically search for airlines mistakes or intentionally great deals and email them to you. We haven't used it ourselves, but it seems worth a try (they have a free plan too). Croatia Travel Guide | Pin me for later! You can also travel to Croatia from other European towns by bus. Bus schedules are a bit harder to search for as there are many different bus companies running the service. However, if you would like to travel by bus, we highly recommend using GetByBus website to check and book intercity buses in Croatia and beyond. You can also check with a local bus station once you are in destination and you can physically walk there. Getting information over the phone, or email can be impractical, and expensive (yes, they still use automated phone machines that makes you wait forever, and charge you a fortune for waiting!). Train connection to and around Croatia is quite limited, and we generally don't recommend travelling by train to Croatia. However, if you really have to, you can find more information on Croatian Railways website. Our favorite way to travel around Europe, and to Croatia as well, is by car. Whether it's your own car or a rental car, it's the most convenient way to move around Europe. The best way to travel around Croatia is by car. Croatia is a small country with great roads, and lots of nice little villages totally worth a detour. The only way to really discover the country is to travel by car. We've written a full post about driving in Croatia as well as about a car rental in Croatia. Another excellent way to travel around Croatia is by bus. Buses are modern, fast, affordable and frequent. The only places we wouldn't recommend bus travelling is on the islands and in Istria. For the rest, if you can't travel by car for whatever reason, hop on the bus and enjoy the ride. Use GetByBus to check lines, schedules, and to book your bus ticket. Ferries are still the most popular, and sometimes the only way to get to the islands. The main ferry ports include Rijeka, Zadar, and Split, but ferries also depart from smaller coastal towns like Brsecine, Makarska, Drvenik, Orebic, Ploce, and Prapratno. Public transportation in the bigger towns cost around 2€ per ride. Taxis are generally pricy (except in Zagreb and Rijeka), but since Uber entered the market back in 2015, cab's ride started getting more affordable. UberX is available in majority of popular tourist towns like Zagreb, Split, Rovinj, Dubrovnik, Zadar, etc.. Uber is by far the cheapest taxi option in Croatia. However, Uber also dynamically adjusts its prices to demand, and prices generally increase during the main tourist season. Here is our full post on how to get around Croatia. One of the most common questions we get is where to go in Croatia. Many visitors who travel to Croatia for the first time tend to visit the main touristy towns and attractions, like Zagreb, Split, Plitvice, Hvar and Dubrovnik. However, Croatia is full of hidden gems, charming coastal towns, wonderful natural sites, and beautiful beaches. Where to go depends heavily on a type of traveler you are, things you want to do in Croatia, time you plan to spend in Croatia, and your budget. With a surface of just over 56.000 m2, Croatia is rather a small country. However, due to its geographical location, geo-morphological, and ecological conditions, as well as its climate, in terms of biodiversity Croatia is one of the richest countries in Europe. The nature here is divine: from the Adriatic sea, high-rising mountains, to plains of Slavonia, and rolling hills of Istria and Zagorje. The country has eight national parks, ten nature parks, and two strict reserves. Almost 10% of the country's territory is protected. National parks of Kornati, Brijuni, and Mljet are located on the islands, and characterised by rich marine life. The Risnjak, Northern Velebit, and Paklenica national parks cover mountainous area. They all feature interesting limestone rocks, meadows, and vast forests. Plitvice Lakes, Croatia's most visited national park, as well as Krka national park, are both famed for its lakes, streams, rapids, and waterfalls. Croatia doesn't lack in cultural and historical sites. Even ten of them made it to the Unesco World Heritage Sites list. These sites include The Euphrasian Basilica in Porec, St. James Cathedral in Sibenik, Trogir, Diocletian Palace in Split, Dubrovnik old town, Stari grad planes on the island of Hvar, Plitvice Lakes, the Venetian Works of Defence from the 16th and 17th centuries in Zadar and Sibenik, Stećci Medieval Tombstone Graveyards in Cista Provo and Konavle, and Ancient and Primeval Beech Forests in national parks Paklenica and Northern Velebit. With an exception of the Plitvice Lakes, all other sights are located along the coast. Here is our list of 7 Unesco World Heritage Sites in Croatia not to be missed. We often get asked about the best type of accommodation in Croatia. For this reason we've written a full post on different types of accommodation in Croatia, with all pros and cons for each of them. Croatia offers a variety of accommodation to choose from: hotels, hostels, apartments, villa rentals, and campsites. Which one is right for you depends heavily on your style of travel, and your budget. Croatia is mostly seen as a 4-star family destination. However, some destinations are fancier than others. This is particularly true for Dubrovnik, Hvar Town, and partially Rovinj. A good choice of 5-star hotels you’ll find in Zagreb, Dubrovnik, Rovinj, and Losinj Island. All-inclusive resorts aren’t popular in Croatia, although some hotels offer all-inclusive formula. All-inclusive Croatia mostly refer to a full board meal plan with unlimited selected drinks at mealtimes. Many hotels in Croatia offer a half-board meal plan, and a diner often comes cheap when purchased as a part of a room rate. Booking.com is by far the most popular website for browsing and booking hotels in Croatia. They offer the largest choice of properties, and have the most flexible booking policy. You can also check hotel’s official website. Sometimes hotels offer special deals available only through their website. Read our full post on hotels in Croatia. Many Croatians rent apartments to tourists. Apartments are a good alternative to hotels. They are cheaper, offer more space and come with a fully-equipped kitchen. Apartment rentals, just like hotels, need to be licensed and get an official star rating. The most popular websites for apartment rentals in Croatia are Booking.com, Homeaway, and AirBnB. Here is our full post on apartments in Croatia if you wish to read further. Another popular and emerging type of accommodation is villa rentals. Mostly located off the big tourist resorts, these villas offer peace and quiet and lots of privacy. Besides, villas come with a pool where you can chill all day long. We have our own villa to rent in Istria – check it out! Or read our full post on villas in Croatia. Croatia is also very popular camping destination. There are lots of campsites all along the coast, and just few of them in continental Croatia. Popular campsites in Croatia include Lanterna in Porec, Valkanela in Vrsar, Polari in Rovinj, Park Umag, and Zaton in Nin near Zadar. The best place to make yourself familiar with Croatian campsites is Camping.hr, an official website of Croatian Camping Association. Many of our readers reach out to us with a question about driving in Croatia, road condition, and safety on Croatia roads. Croatian roads are in a very good condition, with a new multi-lane motorway connecting Zagreb to the north and Rijeka to the northwest with Ploce in the south. Tolls apply on all multi-lane motorways named with letter A, as well as on some bridges (eg. Krk Bridge), tunnels (eg. Ucka tunnel between Rijeka & Istria), etc. A one-way fee from Zagreb to Split (approx. 400 km) costs 181 Kn (25 € / 26,5 $)*. Besides motorways, you can also travel on toll-free state roads. These roads are also in good condition, but with a single lane for each direction, and some of them, particularly a coastal road D1, are winding. Read more: Full post on driving in Croatia you can find here. The best way to explore Croatia is by car. And if you don’t travel by your own car, don’t shy away from renting a car in Croatia. You’ll be able to take in the sights; travel off the beaten path; see more in less time; and have a freedom to stop wherever and whenever you feel. Car rental in Croatia is very seasonal. This simply means that you’ll need to secure your car rental well in advance if you plan on visiting Croatia in July and August. This also means that rental prices increase dramatically in these two summer months. We recommend using Rentalcars.com for your car rental in Croatia. Full post on car rental in Croatia you can find here. All tourists staying in Croatia need to be registered at a local tourist office. And non-EU citizens will also be automatically registered at the police. This is the reason why during the check in process at any hotel, private accommodation, or campsite, you'll be requested to show (and often leave until the next morning) your passport or an ID card. We love food in Croatia. It's varied, fresh, local, and tasty. In continental Croatia people eat lots of meat, while a diet in coastal regions is heavily based on fish and other seafood. As a traveler you might also make some false assumption based on a food offer in touristy restaurants along the coast. One of the most popular posts on our blog is our post on must-try Croatian dishes. Make sure to read it so you don't miss on some of the local specialties. We also give a couple of tips on where to find local, delicious, and cheap eats in Croatia. And don't miss our ultimate list of best places to eat in Croatia. Istrian restaurants rank the highest on this list. The tap water is safe to drink in Croatia. However, if you still prefer to drink a bottled water, bear in mind that bottled water is extremely expensive here. For instance, a 1.5 L bottle of a natural water costs around 6 Kn in a supermarket, three times more expensive than in Italy. Legal drinking age in Croatia is 18. Among alcoholic drinks, wines, beer, and spirits are very popular in Croatia. Drinking usually takes place at cafe bars, serving any kind of drinks, from coffees, and teas, to wine, beer, and any alcoholic drinks. Cafes work all day, opening as early as 6 am, and closing usually around midnight. Night clubs, pubs, and some bars work until 4 am. Local wines are good. In the last two decades many small family-run wineries lead the way with good quality wines made of indigenous grape varieties, like Malvazija, a dry white wine produced in Istria, or Plavac Mali, a red variety dominating vineyards of the southern Dalmatia. Croatians also drink lots of beer, but you'll hardly find an exciting choice of beers here in Croatia (not the case any longer, craft beer scene in Croatia is now super exciting!). The most popular mass-produced local beers are Karlovacko and Ozujsko, both light lager type. In recent years many microbreweries started putting on a market a more appealing craft beer, like San Servolo, Nova Runda or Zmajska pivovara. Spirits are very popular in Croatia, and they come with a variety of flavours. Here they are called rakija. The basic one is most often produced from grapes (called Loza), but then they are flavoured with different ingredients. The most popular are travarica (herb brandy), medica (honey brandy), orahovaca (walnut brandy), visnja (chery brandy), mirta (myrtle brandy), and rogac (carob brandy). Travel insurance covers all kinds of situations if things go wrong: from luggage loss, trip cancellation, to medical assistance. If you are an EU-citizen then your European Medical Insurance Card covers your basic medical needs and emergency medical care. However, it doesn't cover emergency transport to your home country. Non-EU citizens are advised to check with their embassies for what level of medical care they are covered in Croatia, as it heavily depend on bilateral and reciprocal agreement between the countries. For other damages like document and baggage loss, loss of belongings, and trip cancellation, you'll definitely need to purchase a travel insurance. There are many travel insurance companies offering different insurance options and packages. You can compare all your options using a website like Travel Insurance Review. We recommend buying travel insurance from WorldNomads.com. Available to people from 140 countries, it’s designed for adventurous travellers. And it covers an overseas medical, evacuation, baggage and a range of adventure sports and activities. You can buy and claim online, even after you've left home. Croatia offers a lot of activities to do for all ages, and all year round. The country is rich in history, natural beauty, historical towns, wonderful architecture, pristine beaches, and rugged mountains. Foodies will enjoy exploring restaurants in Croatia, especially in Istria, Zagreb, Dubrovnik and Split. Croatia produces some of the world’s best extra virgin olive oils (if you wonder why you should care, read Tom Mueller’s book Extra virginity: the sublime and scandalous world of olive oil). There are lots of places where you can go for an olive oil tasting, and learn how to distinguish the real staff from the crap. A visit to a winery is a must if in Croatia, particularly in Istria. Tisno on the island of Murter, Novalja on the island Pag, and the town of Hvar offer 24 h partying for young and restless. An outdoor enthusiasts will love Omis, Paklenica, and Cicarija. They all offer an endless choice of adventures to enjoy. We’ve written a full post on things to do in Croatia. You can also check Get Your Guide website for a full list of tours and activities in Croatia. We are often asked to suggest or revise a proposed itinerary for Croatia. So here are few things to bear in mind when planning your Croatian itinerary. Although the country is relatively small, it's long (from Umag in the northwest to Dubrovnik in the south there is over 700 km), and it's not that quick to travel from north or west to the south. If you plan to visit Croatia for less than a week, we highly recommend you pick up one destination, and stick to it. Do day trips from there, but don't pretend to visit entire country in less than a week. Also, in July and August, you need to take into account possible traffic jams, and congestions on the roads, as well as queues for ferries. If you stay a week or ten days, you can visit few highlights, like Zagreb, Plitvice, Split and Dubrovnik. If you prefer to join a group tour, we highly recommend to check tours proposed via Tour Radar. They have classical coach, and boat tours, but they also have a great choice of adventure, cycling, and various themed tours. This 10 day tour gives you the best of continental Croatia, and the Adriatic. The tour starts in Zagreb, and ends in Dubrovnik, with a visit to 10 other destinations in between. We like that this tour takes you to the island of Vis, one of our favourite islands in Croatia. You also get to see Korcula, Hvar, Brac, and Mljet islands. The small cruise ship can fit 38 passengers in 20 air-conditioned cabins. The ship is pretty new, launched first in 2013. This 11 day discovery coach tour starts in Zagreb, and ends in Dubrovnik. 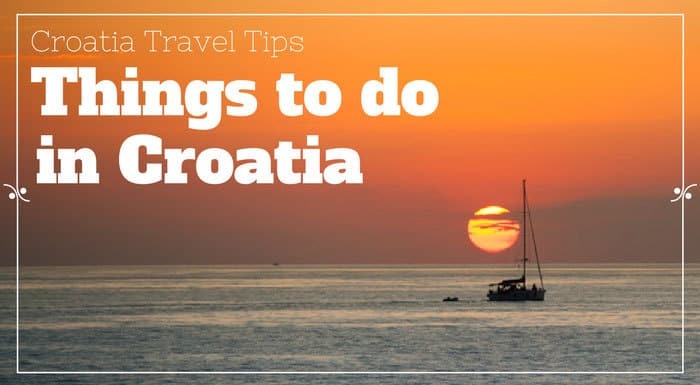 However, it's packed-full of exciting destinations in Croatia, and neighbouring Slovenia including Ljubljana, Bled, Rovinj, Opatija, Plitvice, Trogir, Split, and Peljesac peninsula. You will get to see many great destinations in a short period of time, while still having ample time on your own. The tour also includes one special “Be my guest” dinner where you get a chance to experience traditional meal with a local family. This 8 day island hopping tour operated by Busabout is the single most popular tour in Croatia on Tour Radar. The boat tour starts and ends in Split with stops in Hvar, Mljet, Dubrovnik, Korcula, Makarska and Omis. Bear in mind that Busabout boat tours are intended a bit more toward the younger crowd. A small group tour takes you from Split to Dubrovnik in 8 days on your bicycle. The tour provides accommodation, meals, and transportation. You'll get a chance to test your cycling abilities in Hvar and Korcula Island, along Peljesac peninsula and Dubrovnik. The tour is intended for all levels of cyclists. The scenery along the route is lovely. This 8 day tour takes you paddling across Kornati national park, hiking, rock climbing, and bungee jumping (optional) in Paklenica national park, and cycling through Krka national park with a planned stop along the way in popular Bibich Winery. Expect anywhere between 3 to 6 hours of activities every day, but nothing over-exhausting, rather at laid back pace. The tour starts on the island of Vrgada, and ends on the island of Murter. When you think of shopping, Croatia doesn't necessary come to mind. However, there are a couple of awesome things to buy in Croatia. Croatian artisan olive oils are some of the best in the world. Croatian design and concept stores are also making momentum; check Take Me Home in Zagreb or Prostoria in Rovinj for some original souvenirs, accessories, unique clothes, bags and jewellery. We've written two posts on the subject: What to buy in Croatia, and Croatian souvenirs: fun, cool and authentic. Don't forget a high-end tie store – Kravata Croata. Open markets, where you can buy fresh produce, are popular in Croatia. The largest national supermarket chain is Konzum. Other popular supermarkets in Croatia include Lidl, Kaufland, Plodine, and Spar. Supermarkets are open throughout the day, Monday to Saturday. On Sunday some shops are open all day, particularly in shopping centres, while downtown shops often close at 1 pm or 3 pm. In summer, along the coast, shops are open seven days a week, and often as late as midnight. Croatia is very safe country with very little street crime and almost no violence. However, as everywhere, take care of your belongings, especially when using public transport. Land mines are still present but in remote areas where tourists rarely visit anyway. Internet in Croatia is widely available. WiFi coverage is pretty good, with many towns offering free wifi hot spots at prominent places in a town. Most of private accommodation, as well as hotels, and even campsites, offer a free WiFi internet connection. However, the internet in Croatia isn't as fast as you are perhaps used to. At least it's not as fast everywhere in Croatia. In bigger towns you should be ok. According to the Speedtest.net the average internet download speed in Croatia in 2018 was 43,29 Mbps for mobile, and 28,67 Mbps for fixed broadband. Since summer 2017, roaming surcharges within EU countries don't exist any longer. This means that, if you are with any EU mobile provider, you will pay the same prices for data, calls and SMS as you would pay at home. However, roaming charges for other countries are still pretty high. You can purchase some of mobile operators packages either in your home country, or in Croatia. In Croatia T-com sells 7-days unlimited surfing for 11€. It includes nano, micro, or sms card. You can buy these packages at gas stations, newsstands, T-com centres, and at Croatian post offices. Croatia is a member country of the EU. However, the country is still not a part of the Schengen visa regiment. This means that you'll still need to show your documents at the border entering Croatia from the neighbouring EU countries, and vice versa. If you have a valid Schengen visa, you don't need a separate visa to visit Croatia, but Croatian visa alone won't make you eligible to visit other European countries. You'll need to apply separately for a Schengen visa. Sea and sun are still two main reasons for so many people to visit Croatia. Croatia has over 6.000 km of coastline, and over 1.000 islands. Two most popular coastal regions are Istria to the north, and Dalmatia to the south. Croatian coast is mostly rocky with pebble beaches mostly formed in coves, and bays. Makarska Riviera, located in central Dalmatia, offers the most beautiful beaches in all Croatia. Perfectly round and small pebbles that feel almost like a sand but that don’t stick on you forever. The sea is limpid clear, you can often see the seabed from faraway. My in-laws have a seafront property in Komarna, in southern Dalmatia, and I can see the fish swim in the sea from the third floor of their house. So, if you search for that perfect sandy beach, you might get disappointed with beaches in Croatia. Although there are some sandy beaches here too, they are simply not Croatian thing. In Istria, coast is a bit rougher than in Dalmatia, and pebbles are rare to find. However, the beaches here feel less crowded, due to the well preserved coastline. We’ve put together few posts on best beaches in Croatia if you’d like to read further. If you travel to and around Croatia by car, you might wonder about parking situation in Croatia. Generally speaking majority of hotels and private accommodation offer a parking spot free of charge. However, bear in mind that city centres are usually car free zones, or have a limited car traffic. If your accommodation is within a city centre enquire about parking before booking. There are three types of parking: garage parking, open air parking lots, and street parking. Expect to pay around 8 to 12 kn per hour in towns' centres. However, some parkings are more expensive, like parking at Riva in Split that cost 20 Kn for the first hour, and 25 Kn every consecutive hour; then, Dubrovnik, where you will pay an hour of parking in Zone 0 as much as 75 Kn. We talk more in-depth about parking in our destination guides. Don't forget to check them once you decide on your destination. You don't speak Croatian? No worries, most of Croatians speak at least some English, and many speak at least another foreign language. Besides English, German and Italian are most widely spoken in Croatia. We hope you've found useful our Croatia Travel Guide. Is there anything else you'd like to know? Let us know in the comments below. Thanks for all the great advice. For a two week holiday, can you suggest which towns to stay in? I’d love to visit Zagreb, Plitvice, KrKra, Split, Hvar and Dubrovnik. I’d like to stay in two or three places and do the rest from there. You can stay in Zagreb for a day, Plitvice either for a day or in transit from Zagreb to Split, Hvar for 2-3 days if you want to visit the entire island; otherwise book an island tour from Split. So if you only want to stay in two or three of these towns, make it Zagreb, SPlit and Dubrovnik, because they are best located to do day trips elsewhere. Great blog. Thanks for the info. We – fellow Canadians – plan to spend Jan to Mar 2019 in Croatia, basically in the Trogir area. We’d appreciate any further thoughts you’d wish to pass on. I would like to know about tipping in Croatia for bus drivers and tour guides. Our travel club is bring a group to Croatia in May 2019. I always go with 10% when in restaurants. As for the rest, you give what you feel. Normally, you collect from the entire group and you give it at the end of trip if you were happy with the service. I am not aware that there is a tipping rule for drivers and guides as for how much should you tip. You basically tip what you feel they deserve. Hi..We are planning to visit next year..Have children who will be agedelivered 11 and 13..are there things for them to do? In Septemeber everything should still be open. No worries. Thank you for your blog and the very valuable information you provide. My family (a total of 16 of us) are visiting Croatia at the end of this month. 3 of us are from BC Canada so it has been even more exciting to hear what you have to share. Thanks for reading, May! Hope you had a great time in Croatia. Just found your blog and its just what i,m after, so much information. I am visiting Croatia next month with my son, we are staying near Trogir. I was going to take kuna but you say most places take Euros? I have rented a car and plan to travel around a bit. I am watching the World Cup finaland cheering for the team! I decided to visit the beautiful country in 2019 with my family. Look forward to it! We’re going in September to visit Lokve, where my husband’s people are from. Have you been there? Can you tell us anything about it? Thanks! Haven’t been there, Kass. Sorry! We are currently in Croatia and it is just beautiful. The water shades from turquoise to deep blue and the rocky hills provide a beautiful contrast in the landscape. We stayed rather in the south and we took the E65 coastal road. If you have time to spare and you are not in a hurry, I recommend this road compared to the highway. I wish I could describe it but I will never be able to narrate the full picture, so I made a short clip on our journey that I wish to share. thanks for sharing, Lynn! Great clip, it shows well what to expect. However, most of the video is made in the northern part of the road, between Rijeka and Zadar. Hello, very nice blog of yours! I was wondering what area you would suggest a family of four to stay in. A place that is child friendly and filled with entertainment is something I had in mind, but would like to know what places wold exactly fit my needs. Thank you! Please add me to your list. I plan to visit this wonderful country in 2019.
if you would like to receive our newsletter, please sign up for it through the website. Let us know if we can help with anything regarding your upcoming trip to Croatia. I have been to Croatia with my mum last year and this charming country won our hearts, Frank! I still haven’t crossed Dubrovnik off my bucket list, but your post was truly inspiring. I guess now I have plenty of more reasons to explore magnificent Croatia! Hi guys, we love your blog and passion for Croatia. We are a family run business, that runs 3 adventure bases in Croatia. We only employ local staff and follow green responsible policies. We would love to talk about working with you. Whats your best mobile number?